When layering on my jewelry, I always start with the pieces closest to my heart which is usually my Om and Zodiac necklaces on 18 inch chains. My 18 inch chain is followed by a 24 or 32 inch chain that hangs at my Solar Plexus Chakra. The solar plexus is the core of your self where your will, power, and assertiveness originate so that’s where I love wear a symbol of strength or wisdom like a Mandala or a Hamsa. I always finish with a gemstone mala that I have usually made myself. An authentic gemstone mala that’s infused with my own intention works to ground and remind me that I can always find inner piece when I turn within. Last but not least, my wrists are always filled with bracelets of healing gemstones and symbols which all have their own meanings. Rather than select my stack based on color, I allow my intuition to guide me to exactly what I need. A Mala is not a regular necklace. Malas have been used for thousands of years in yoga and meditation of Buddhism and Hinduism. Normally, malas are made out of 16, 27, 54 or 108 beads, and each bead of the mala is used to keep count of each time reciting a mantra or the name of a deity. This kind of meditation is called “Japa” in Sanskrit, and it consists on counting the beads of the mala while reciting a positive affirmation or mantra along each bead to come into a more calming, connected and spiritual state. A traditional tool for prayer and reflection, the mala has been a part of Satya Jewelry collections since the beginning. Malas can easily be wrapped around the wrist or it can also be worn as a bracelet, and the 108 beads serve as a reminder to meditate on what is important and sacred in our own lives. You can find online here in our Mala collection. Statement cuffs, by definition, can dominate an outfit. When it comes to wearing cuff bracelets, the challenge and the genius is in striking a balance between punctuating your outfit without overpowering it. So how does a savvy dresser accessorize with cuffs? Tip 1: Keep other accessories minimal, or better yet non-existent. Pile on too many accessories and risk looking weighed down and confused. Tip 2: Don’t be afraid to stack cuffs. Your wrist and arms are the area of focus, and stacked bracelets can put an underline on that emphasis. Tip 3: Statement cuffs aren’t just for going out. Big cuffs can amp up an everyday uniform of jeans, a t-shirt and booties. Tip 4: Set off metallic cuffs with bold colors. 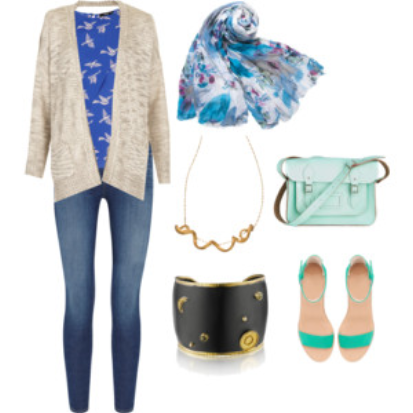 We’ve tried to put some of our tips into practice with a few Polyvore sets. Take a look at our selected styling of some of favorite cuff bracelets for everyday wear, from workday essentials to weekend going-out wear. A cuff can add dimension to even the most comfortable of outfits. Add our stack of silver bangles cuff to some kicking heels and you’re styled and ready to go! Sling on our braided gold cuff on your way to work helps to chase away a case of the Monday blues. Headed to a picnic in the park? Mix our statement-making celestial moon & sun cuff with a casual cardigan to take you on errands or wherever you’re headed. Looking for something that’s a little more Ooh la la rather than om? Our same celestial cuff can add some dramatic flair for an evening out. Feeling a little breezy? 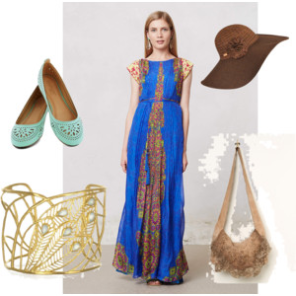 Pairing our dreamy peacock feather-inspired cuff with a long dress will keep you feeling and looking like a goddess. Nicole Alyse Personal style blogger based in Brooklyn, New York. Her unique style caught our attention because of her combination of vintage finds and trendy pieces that have meaning. She is a vintage buyer and stylist for @GypsyWarrior. What does Nicole love? Coffee, vintage tee, and black boots! 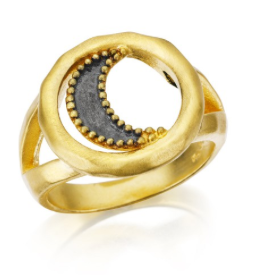 She recently featured the Gunmetal and Gold Wax and Wane ring on her Instagram.